Forgeline’s line-up of custom-built forged wheels makes it clear that they are passionate about cars. 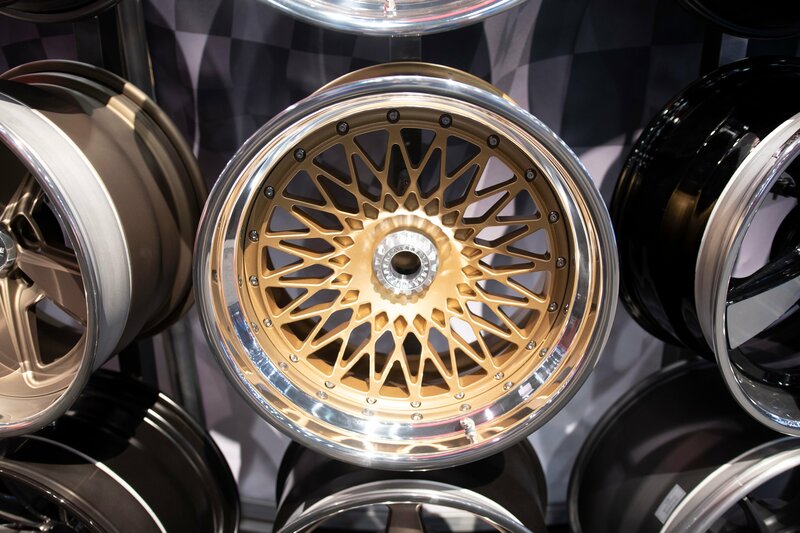 From pro-touring American classics to European exotics and endurance road race cars, that passion translates to manufacturing one of the highest-quality forged aluminum wheels on the market. Unlike the mass-market competition, Forgeline takes pride in their array of wheel center designs, rim half selection, and wheel finishes that translates to a customer typically having the only set of personalized Forgelines in town. In addition to being street performance enthusiasts, the staff at Forgeline are also racers. Firsthand racing experience gives them a big advantage over other wheel manufacturers and they continually test new innovations on the track. Knowing what it takes to compete in Grand-Am, SCCA and the ALMS series means that they manufacture wheels with the right features to meet the extreme demands of racing. This wheel expertise is recognized by many of the top-tier race car builders in the world. General Motors motorsports engineering partners Pratt and Miller and Riley Technologies worked closely with Forgeline to produce the race wheels for the 2010 Camaro GT-R and GS-R programs. In fact, every Camaro GT-R that is produced at the Pratt and Miller facility rolls out the door on Forgeline wheels. Forgeline’s 3-piece designs allow them to offer a huge range of fitments without the limitations associated with one-piece wheels. Forgeline’s fitment specialists work with the car builder to find the best balance between required brake clearance and maximum outer lip depth for an aggressive appearance. Applications are available for many of the world’s most exotic cars including Corvette, Viper, Aston Martin, Ferrari, Lamborghini, and Porsche. Rim diameters are available in 18″, 19″ 20″ and 22” SUV applications, with various inner and outer rim widths. You don’t have to own an exotic car to enjoy the quality and prestige of Forgeline’s 3-piece wheel. With the recent popularity of resto-mods or pro-touring builds, Forgeline Wheels are available for classic Camaros, Chevelles and Mustangs. Wheel applications for late model American iron like Mustangs, Camaros and Challengers are also available. Finite Element Analysis (FEA) lets Forgeline simulate the stresses on wheel components before manufacturing begins, ensuring strength and durability in the finished product. Forgeline wheels, like the name implies, are designed for strength, durability and performance – yet weigh less than most wheels currently on the market. Before Forgeline releases a new design, a computer model of the wheel is created and it is tested using computer stress analysis. The sophisticated computer model enables Forgeline to analyze the wheel design under a simulated load and tests critical stress points. This series of Finite Element Analysis (FEA) tests optimizes wheel design and construction before final machining of the wheel center and rim halves begin. Forgeline's forged street and race wheels are designed and produced in their Dayton, Ohio facility. Forgeline’s 3-piece wheel components consist of the wheel center, inner rim section and outer rim section. All three pieces are produced in their Dayton, Ohio facility, with the same machinery and technology as their championship-winning Grand-Am Rolex series race wheels. Each wheel starts as a piece of 6061-T6 aluminum billet rod stock. 6061-T6 has a yield strength (the point at which it begins to deform permanently) of at least 35,000 psi, and an ultimate tensile strength of at least 42,000 psi. The wheel centers are created from the billet rod using a mega-ton hydraulic press. The billet rod is heated to a specific temperature and placed into a precision die where it’s pressed and forged into its basic shape. Forging aligns the grain structure in the aluminum, reduces porosity, and increases uniformity in the material, thereby increasing the strength to weight ratio. The wheel center forging is then heat-treated to be 40% stronger than cast aluminum. “Our wheels are made from the same aluminum material and treatment process as the aerospace and aircraft industry use,” said Forgeline’s David Schardt. Forged wheel center blanks progress to a CNC mill where they're machined to their final form. Thanks to the ease of changing the design in the computer, this manufacturing process lets Forgeline offer a wide array of different wheel centers from the same basic forging. The inner and outer Forgeline rim sections begin life as a large aluminum sheet that is formed using a lathe. The spin forming process refines the aluminum grain structure in a process similar to forging in a press. After the rim half is formed, it is heat-treated, then a CNC mill machines the inner diameter of the rim half and the bolt attachment holes that are used in final assembly the wheel. The bolt pattern, the wheel assembly holes, and the offset pad are all cut on the CNC mill, but final quality control is a hands-on process. Here, a technician checks the spoke pattern before the wheel center moves to the finish department. In the final assembly department, the polished outer rim half is attached to the wheel center and inner wheel half. Forgeline offers optional titanium assembly bolts with chromoly “jet” nuts on its competition 3-piece wheels. This fastener combination removes a pound of extra weight at the outer part of the wheel, reducing rolling inertia. Every bolt on Forgeline’s 3-piece wheel is torqued to specification by a wheel technician. After wheel assembly, each rim is sealed and checked for fit and finish, and proper run-out is measured to ensure the wheel is concentric. Another new option for three-piece wheels is Forgeline’s rear bolt assembly capability, or ‘hidden’ bolts. “We’ve had some requests from people that love the style of our wheels, but they don’t like all the bolts on the outer edge of the wheel center. We’ve created a way to drill, tap and helicoil the wheels so you can’t see the fasteners from the front for a nice clean look,” explained Schardt. The SEMA Cares WD-40 Camaro was equipped with 20x9.5 and 20x11 Forgeline DE3S's with the new Center Lock option and custom-painted outer rims. For car builders looking for a one-off wheel, Forgeline offers an almost countless number of wheel finishes for their forged wheel applications. They offer paint, polish, anodized, or chrome on the wheel centers, and outer lip finish options include polished, chromed, powder coat paint, brushed, brushed nickel, or a pinstriped painted lip. 2010 CTS-V with 20x9 and 20x10.5 MD3P with black chrome center and chrome lip. Forgeline has also added several satin and matte colors to their paint palette to create the popular matte center and gloss outer lip wheel combination. In addition to offering a stealthy look, the durable wheel finish also hides brake dust. Forgeline’s Premier Series three-piece wheel is king on the street with ten wheel center designs to choose from. Mesh-spoke and multi-spoke designs combined with several wheel finishes give a car builder hundreds of options to choose from. The selection lets the car builder pick the perfect wheel style and finish for their unique ride. Premier series wheels are available in 18″ through 20″ wheels sizes. Each Premier Series wheel is built with forged 6061-T6 centers, 6061-T6 spun rim halves, stainless steel aircraft-grade fasteners, and feature a powder coated or chrome finish with a polished, powder coated or chromed lip. Forgeline’s Performance series wheel features a stepped lip and raised spokes that give these wheels a very aggressive look. With Forgeline’s ability to build custom offsets, a car builder is able to fill the wheel-well with as much tire and wheel as possible. The Performance Series stepped lip design allows the use of a smaller-diameter wheel center and makes the wheel lighter than a standard wheel. For applications that require a Tire Pressure Monitoring System, the TPS sensors can be mounted in the valve stem hole on a stepped lip rim. Every Performance Series wheel is built with true forged 6061-T6 centers, 6061-T6 wheel lips and aircraft quality fasteners. The Performance Series feature a standard center polish finish with a polished lip. Optional wheel finishes are also available for a custom look. Performance series wheels are available in 17″ through 20″ wheels sizes. Forgeline’s three-piece ZX3R, WC3R, EV3R and one-piece EV1R racing wheels have been used by professional car builders and race teams for over 15 years. These wheels are strong, light, and the EV1R and EV3R offer additional clearance around the lug nuts for quicker pit stops and easy access with air guns. The EV1R is a one-piece wheel that is 20-25% stiffer than Forgeline’s 3-piece wheel. Constructed of 6061-T6 forged aluminum, the monoblock design is also compatible with all tire pressure monitor sensors and offers increased brake caliper clearance. The EV1 is available in powder coated, polished or brushed finishes. Forgeline racing wheels offer considerable flexibility in sizing and offset availability. The new EV wheels are optimized for weight and strength to withstand punishing endurance events like the Rolex 24 Hours of Daytona. Competition Series wheels are available in 17″ through 19″ wheels sizes. Forgeline’s in-house inventory, manufacturing, and finishing of all 3-piece wheel components means quick turnaround for custom wheel orders. Once an order is placed with a Forgeline wheel specialist, a finished wheel typically ships within a few days.